The AAI Corporation doesn’t know the name of the two foot-by-three foot tablet its representatives are showing off. “You, uh, wanna talk about what we’re gonna call this?” Chris Ellsworth of AAI asks his colleague, Todd Alexander. Alexander shakes his head. He just thinks it’ll be the primary tool of battlefield commanders in the near future. Names come later. “It’s so new, you’re gonna have to name it,” PR rep Sharon Corona tells me. It looks a little bit like a ghost from Ms. Pac Man. But Ellsworth has just directed a drone — in this (fictional) case, one of AAI’s tiny Aerosonde-1 spy robots — to the enemy position. Whoever’s sitting miles away in an air conditioned Ground Control Station, wielding the joystick that controls the drone, has now received her new orders on an equivalent device — perhaps the smartphone that the Army might one day put in her pocket. Either way, an IM confirming the order is understood pops up on an adjacent flatscreen TV repurposed as a computer monitor. The drone above our fictional warzone should be on its way to its new position imminently. If this sounds a little familiar, it should. The military’s Command Post of the Future pulled together disconnected software programs used to track different elements of a war — from drone flights to artillery blasts to enemy movements. If it could be networked together securely, Command Post of the Future united it. There’s one thing it can’t do: kill someone. 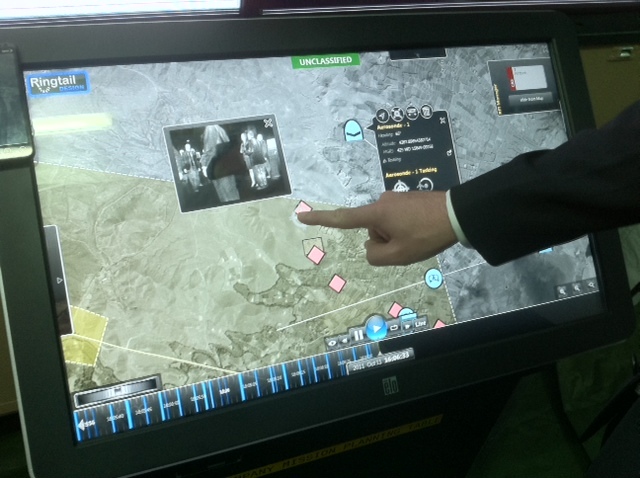 The tablet can only tell, say, a soldier controlling a drone what the drone’s mission is. It is not itself a Ground Control Station. The military is wary of equipping its drones with such a far-reaching degree of autonomy, lest it risk losing control of a flying spying/killing machine. With computer viruses infecting drones at Creech Air Force Base, it’s understandable. That is, the drones don’t have that much autonomy for now. Theoretically, Ellsworth and Alexander say, if something can be networked together, it can be directed from the planning tablet. Should the military opt for greater drone autonomy down the road, then perhaps a successor tablet could one day fly a drone. Maybe even allow a commander to fire a missile from one someday. 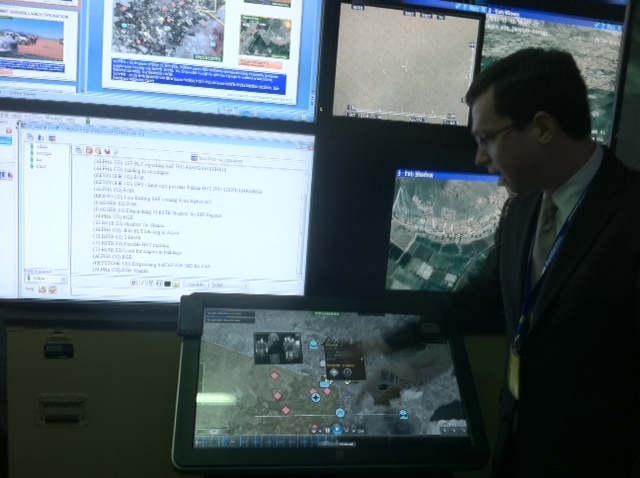 For now, the tablet is housed in a replica Tactical Operations Center set up on the floor of the Association of the United States Army convention in Washington. AAI won’t talk about how much it costs, and this is a time of budgetary austerity for the Army. Still, when I look over my shoulder, I see a group of field-grade officers peeking in at my demonstration session. They’re up next, so AAI’s representatives politely usher me out.